The Legacy of Seattle Hip-Hop was an intimate look into the people, places, and events that make up one of Seattle’s most vibrant cultural communities. 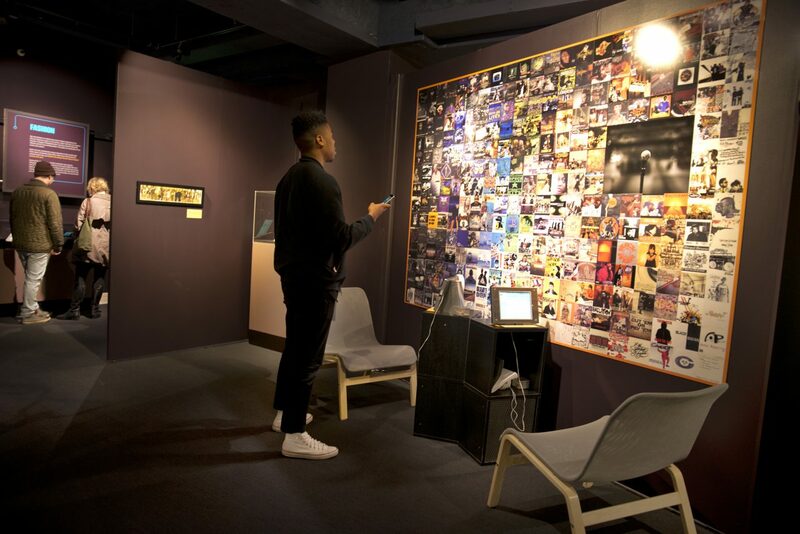 Curated by Seattle natives Jazmyn Scott and Aaron Walker-Loud, this interactive exhibit immersed visitors in the sights and sounds of the region’s growing Hip-Hop culture through audio recordings, photography, artwork, artifacts, and more. 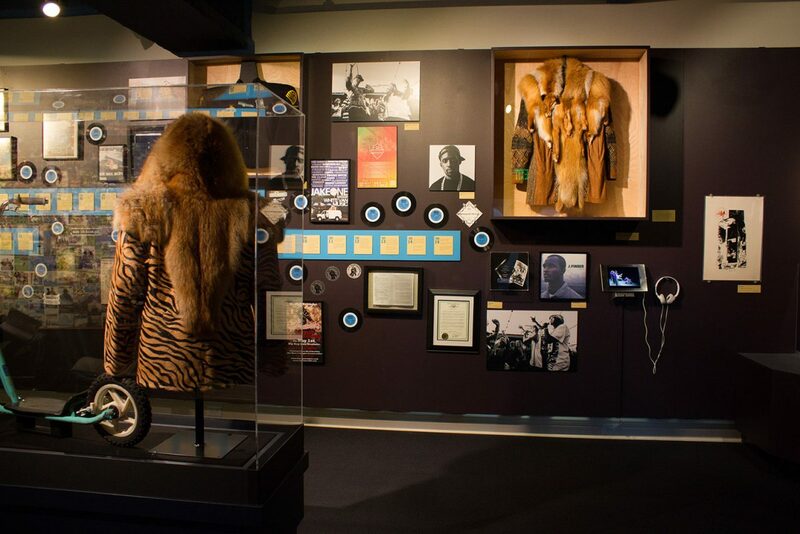 The exhibit explored many facets of the Seattle Hip-Hop scene, including graffiti, deejaying, dancing, production, and emceeing, linking Seattle to the continuously evolving global Hip-Hop movement. The exhibit brought the first-person narratives and experiences of Seattle performers and artists to the forefront, creating an intimate and human look at this dynamic art form. This is exhibit won a 2016 American Association of State and Local History Leadership in History Award. There are a number of characteristics which define Seattle emcees, but two stand out in particular: the importance of representing home and a willingness to be different. Here’s an exhibit visitor checking out Seattle Hip-Hop artists’ album covers. Hip-Hop fashion and style is an extension of the music and culture. Seattle has always been a trendsetter when it comes to fashion. See those dichotomies of style in the jacket Mackelmore used in his Thrift Store video and Raz Simone’s fox jacket. The original Hip-Hop deejays created innovative audio landscapes by selecting and rearranging “breaks”—the stripped down, drum-heavy sections of Funk, Soul, Reggae, Boogaloo, Salsa, and Jazz-Fusion music. Seattle’s deejays have backed world famous Hip-Hop acts, as well as won accolades at international competitions. 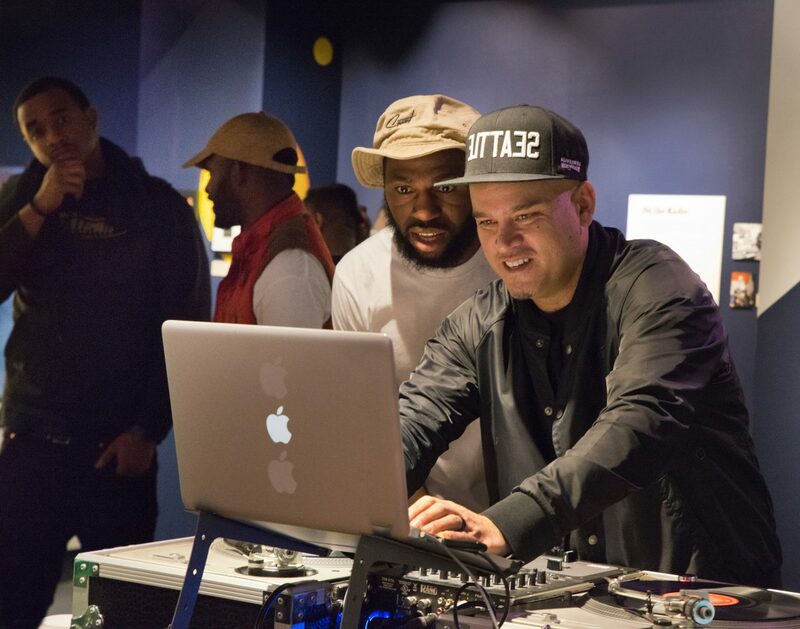 During the run of the exhibit, deejays played for MOHAI visitors during the Saturday Spin. Music production is a vital piece of Hip-Hop’s equation. 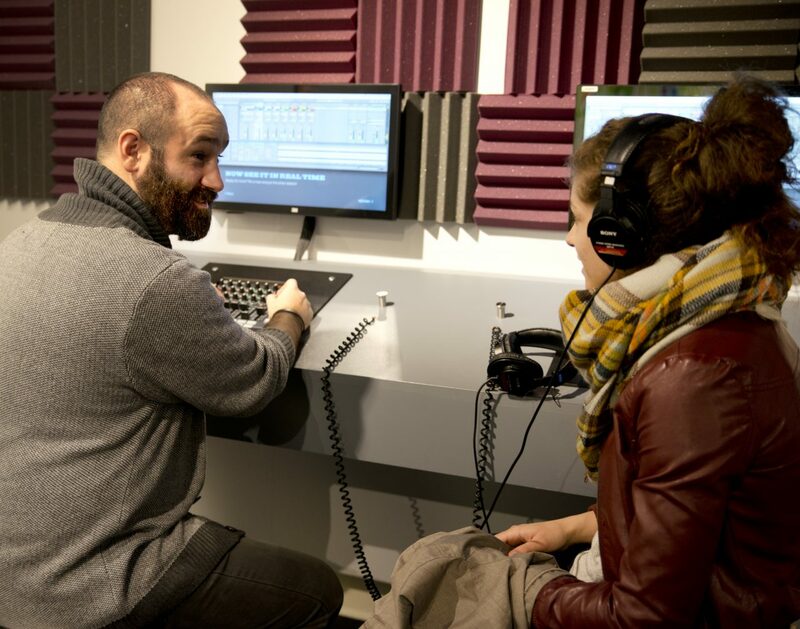 The traditional role of a producer in a studio setting can include controlling the recording sessions, coaching and guiding the performers, and supervising the recording, mixing, and mastering. In Hip-Hop, the producer’s role can also include music composition, as well as arrangement of vocals performed by emcees. 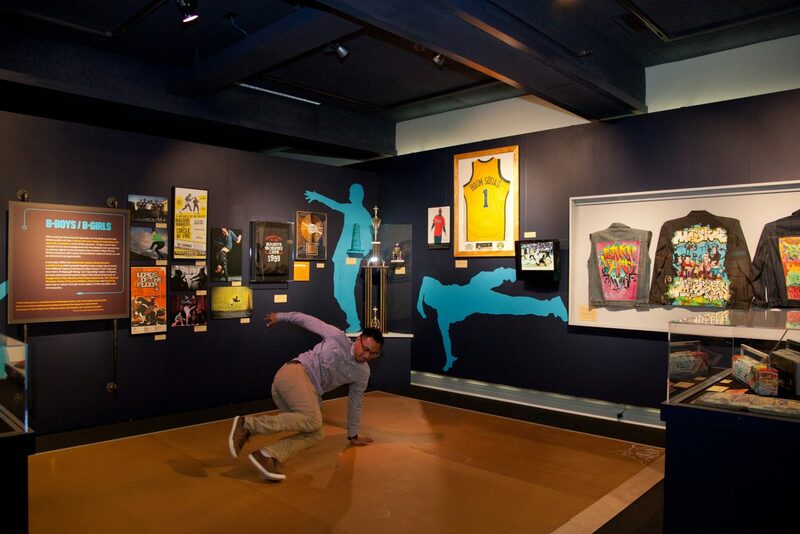 The Legacy of Seattle Hip-Hop visitors could manipulate and dissect tracks created by Jake One and Vitamin D.
In the early 1980s, the mainstream media coined the term break dancing, which grouped together many unique dance styles from different regions including the West Coast’s “Funk” style and New York’s “B-Boying/B-Girling” and “Uprocking” styles. Seattle’s dance crews have had a potent impact on culture through music videos, TV, film, education, and choreography. The Legacy of Seattle Hip-Hop featured a mural made exclusively for MOHAI by local Seattleite, SPECSWIZARD, who has been making art and music in Seattle since 1978. As a prelude to The Legacy of Seattle Hip-Hop exhibit, MOHAI’s monthly series, History Café, welcomed Dr. Daudi Abe, a professor, writer and historian who has taught classes on culture, race, gender, communication, education, hip-hop, and sports. Dr. Abe wrote Emerald Street: A History of Hip-Hop in Seattle 1979-2015, and discussed the Seattle Hip-Hop community, from Seattle’s champion break dance crew, to highly collaborative and diverse performers and DeeJays in this lecture. A panel of Seattle artists discussed their experiences as queer trans people of color (QTPOC) and the representation and visibility of QTPOC in media, history, activism, and the art world. The discussion was moderatored by DJ Sassy Black Cat of THEESatisfaction. Panelists included RC Brown, artist/musician/DJ, activist, and community organizer; Storme Webber, a Two-Spirit, Aleut/Black/Choctaw writer, interdisciplinary artist, curator, educator, and cultural producer; Lulu Luzviminda Uzuri Carpenter (aka Lulu), a cultural worker and producer. Jazmyn Scott is the owner and operator of The Town Entertainment (established in 2009), a cofounder of 50 Next: Seattle Hip-Hop Worldwide (est. 2012), the Program Manager for the Atlantic Street Family Resource Center and an avid supporter and member of the Seattle music and arts community. Aaron Walker-Loud is the founder and director of Big World Breaks (established in 2004), a cofounder of 50 Next: Seattle Hip-Hop Worldwide (est. 2012), Education Director for Seattle JazzED, a teaching artist for Arts Corps, as well as a music educator.